Bodies as automatons? It’s a philosophical question that sits at the heart of choreography. Can dancers deliver the same movement, at the same intensity again and again without deviation or wrinkle? 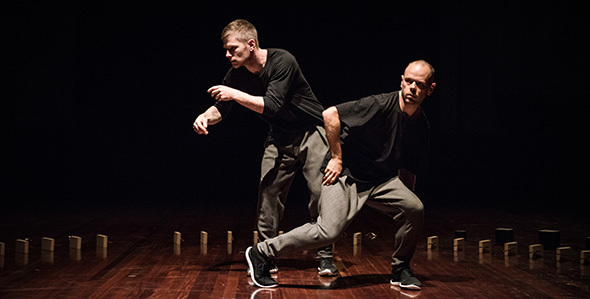 Both Antony Hamilton originating the choreography and Alisdair Macindoe inventing the bots and polyrhythmic composition dissolve the seam between choreography and composition. Their meshing as a performance duo with highly tuned musicality is a feast of call and response and displays acres of tensile strength. Imagine the microseconds before the gun of a 100m race is fired: Macindoe and Hamilton don’t go on the ‘b’ of the bang, they play in the space when the lips begin to close and formulate the hum of the ‘b’. With the 55 minute performance split into three sections, the first sees Hamilton and Macindoe inhabiting the 4-metre radius circle of bots (64 pieces of wood measuring no more than 20 x 15 x 10 centimtres with a pencil attached to a pivoting mechanism on the side, tapping the floor at different intervals); this intensity of focus and action does not allow our gaze to wander or be distracted by any superfluous activity. It deepens the connection between audience and performers as we’re all submerged in this tight frame for the first 25 minutes; it is relentless adventure with feats of physical and verbal memory. Hamilton and Macindoe are human gnomons casting shadows and carving air as they latch on to one of the many polyrhythms created by the orchestra. The primary choreographic language employed is popping (sometimes known as the robot dance), building staccato patterns through the isolation of muscles in their arms, neck and torso. The style ensures a crisp, cool and technically impressive feat yet Macindoe does not match Hamilton’s skill. The difference is clear and Macindoe is not able to execute and pop as the softness of a contemporary training blunts the edges required. As Hamilton slowly breaks the circle of bots, we see his b-boy history as he softly baby freezes over the boundary of bots, shifting his weight as he meets the floor and begins to reconfigure them into a new formation. With a series of miniature robotic henges casting dawn-length shadows across the stage we began to see and hear a transformation. There is a delicacy in play in the second section — a balance between sound, motion, the sound of motion and the motion of sound. The sonic palette has shifted too as miniature trays, blocks and alternative materials are placed underneath the pencils and as they strike down alternative tones reverberate and the monochromatic drum march has been replaced with a textured soundscape. Time is often foregrounded; from the unfinished and rewound repeated movements glitching in our eyes, to the complex musical time signatures pulsing in our ears — we know that time exists but are unsure at which speed it is being played out. This invisibility is remembered at the end as the dancers leak off stage and the audience is serenaded for the last five minutes by the orchestra. Even though the bodies are no longer present, the interweaving of choreography and composition ensures a physical residue in the audience memory. As the tones shift I see their bodies echo in the space, popping, patterning and replaying movement sequences that were present a few moments before. There were dozens of moments of virtuosity: from an eyes-closed verbal recall of a numeric pattern at Mach 1 making them sound like a pair of Australian market traders bamboozling the audience’s ears, to a tight hand sandwich duet at close proximity as they pivot and twist, using their palms as records moving in and out of a jukebox at speed. As an audience we’ve been internally tightened and our gears wound watching these feats without breathing or shuffling in the rich and sparse landscape Hamilton and Macindoe have created. Meeting is a quietly rich encounter between man, machine, motion and sound that rewards your attention with mesmeric human feats and meditative sonic patterns.